In non veg recipies we commonly use onion masala paste. Along with we add tamarind juice here. This gives nice taste to the recipie.. Fish : half kg, washed and cleaned. Take sliced onions,poppy seeds,ginger and 9 garlic cloves into mix jar and make paste. Soak tamarind in 2 cups of water. In big wide pan add 3 table spoons of oil. Once heat add crushed 5 garlic cloves, cumin seeds,red chillies and curry leaves saute for 1 minute. Add onion paste saute for 2 minutes. Then add turmeric powder, coriander powder, masala powder, red chilli powder and saute for 1 minute. Add fish pieces on the above to masala paste. Fish pieces must separate each other. Don’t stir fish pieces randomly otherwise pieces will brake result you didn’t find any piece at end. Twist fish pieces very very carefully untill both sides will nicely cook . Max 10- 15 minutes is enough because fish doesn’t take much time for cooking. Cook in slow flame. Meanwhile squeeze the tamarind pulp in water and extract the unused pulp and seeds. Add this tamarind water and 1 cup normal water (untill the pieces will sink in water) to the pan and maximize the flame. Adjust salt, tamarind sourness and red chilli powder bring to boil. Once reached boiling point reduce flame to simmer and cover with lid. 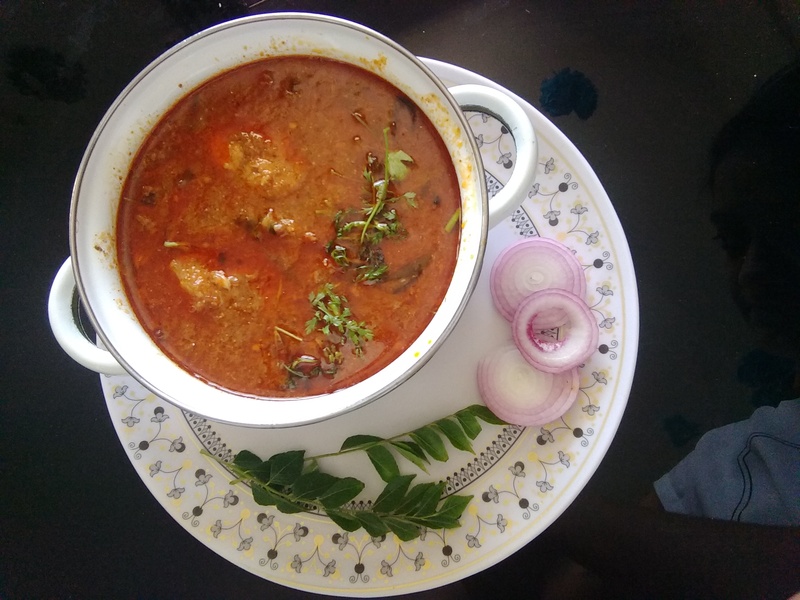 Boil this upto 15 – 20 minutes in simmer flame finally add chopped coriander leaves serve hot…With rice..
Yummy… Fish curry is ready… Yummy.. The more you boil the curry the more taste you get.